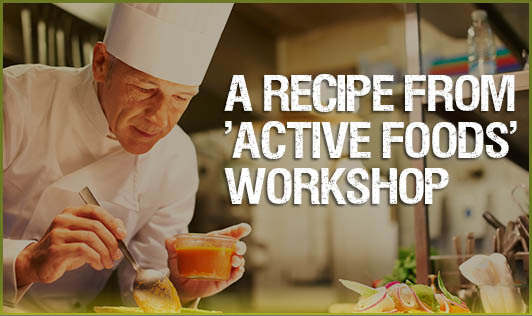 Food Lovers Club, which is run by Kripal Amanna, publisher and editor of the popular magazine Food Lovers Bangalore, conducted a healthy foods workshop called Active Foods last Saturday (Dec 11, 2010), which ran full-house. The workshop started with an interactive session on Weight Management (conducted by yours truly), followed by a cookery demonstration of healthy dishes (conducted by Naren Thimmiah, Executive Chef of Gateway Hotel, Bangalore) and ended with a healthy lunch prepared by the hotel chefs. Smoke the apple with wood charcoal till it is tender and then peel it. Prepare a fine puree of apple and yogurt together and strain once. Melt gelatin and warm the pureed mixture. Add gelatin to the warm puree, pour it into a mould of your choice. Allow it to cool and put it into the refrigerator to set. Once set, demould on a bed of lettuce and serve with grape coulis. Garnish with sliced apples. Puree the grapes, strain and add sugar and salt. Put it on a slow flame until the juice reduces to 1/3rd of the original amount. Cool and store it in bottles. Use droplets of the same on the plate to finish.